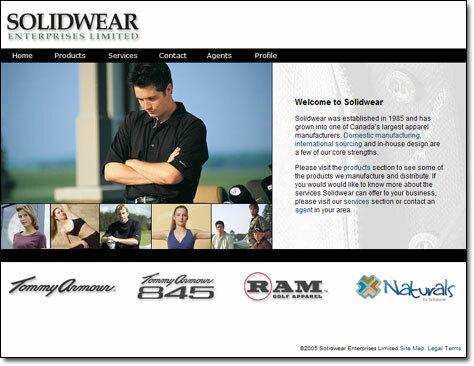 Solidwear is one of Canada's largest apparel manufacturers. They contacted us to redesign a website that they had developed, but which didn't portray the professional image that they desired. They also (like many other clients) wanted it up and running "yesterday". We re-engineered the site from the ground up. We redesigned the site's structure and increased security. We created a design that helps reinforce brand identity for their major labels. We implemented intuitive menu-based navigation that provides visitors with quick access to pertinent content. And we had it ready in one week. They were very happy with the results. Click here to visit the site. Let us know what you would like your website to do for you, and we'll give you a free quote. When it comes to creating an attractive web page, we follow established design principles that help make a design stand out. For example, having a lot of "white space" on a page (space between elements) can lend a feeling of high quality or exclusivity to a design. This principle comes from traditional print design, where having a lot of empty space on a page meant that the company was doing well enough to have a lot of empty space on a page. Another sound design principle is to ensure that the eye is drawn to an obvious "center of interest". For example, in the image to the left, the eye is subconsiously drawn to the large photo, as opposed to the text or the smaller photos underneath. Having a "center of interest" is essential to a good design. If the eye is not drawn to a center of interest, the design may seem to lack interest altogether.